The Organic Yirgacheffe-Gedeb is sourced by METAD Agricultural Development plc on their Yirgacheffe-Gedeb Estate. This site is about 30ha and has its own washing station operated by METAD and located between 1,700 and 2,200 masl with an annual rainfall of 1,200 mm to 1,599 mm in the Gedeb District of the Southern Nations and Nationalities & People Region Gedio Zone. 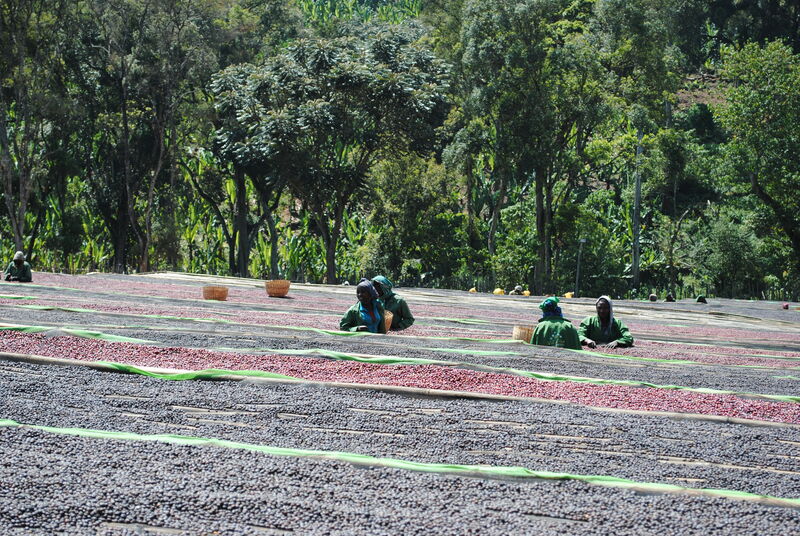 The Gedeb site processes its own coffee using Penago's Eco-Pulping machines installed by METAD, and dried on raised African beds. The soils in the southern and western parts of the coffee-growing regions of Ethiopia are of volcanic origin, with a high nutrient-holding capacity for clay minerals. The soil type of the area is ‘Clay-loam’ soil. All of the coffee-growing Regions have fertile, friable, loamy soils, with a depth of at least one and a half meters. The topsoil is dominantly dark-brown or brownish in color, with a PH ranging mostly from 5 to 6.8 (water extract). METAD grows and processes green Arabica coffee for export to specialty importers/roasters in North America, Europe and Asia. The company is a third generation family-owned business, currently led by Aman Adinew who also was one of the founding Executives and COO of the Ethiopia Commodity Exchange (ECX). METAD is registered with the Ministry of Trade and is a member of Ethiopian Chamber of Commerce, Ethiopian Exporters Association, Ethiopian Growers Association, Specialty Coffee Association of America (“SCAA”), Specialty Coffee Association of Europe (“SCAE”), Specialty Coffee Association of Japan (“SCAJ”), and African Fine Coffees Association (“AFCA”). METAD currently owns and operates the first and only private state-of-the-art SCAA certified coffee quality control lab on the African continent. The laboratory is being used to train both domestic and international coffee professionals. The company has sustainable farming and processing operations in “Hambela”, Guji Zone, Oromia Regional State; and a processing site in “Gedeb”, Gedeo Zone (Yirgacheffe), Southern Nations, Nationalities, and Peoples Regions (SNNPR) Regional State respectively. It also has socially responsible operations where currently, over 70% of the Hambela farm and Gedeb site workers are women, a percentage they hope to continually increase. A portion of all METAD profits are re-invested in the community. In addition, over 650 elementary school students in Hambela are sponsored to ensure they receive a world-class education. For more detailed information about METAD, please visit their website at: www.metadplc.com. Cupping notes: Complex body, delicate, buttery, lemon, citrus, herbal tea, and floral.